Garant GPWB24 24 in. 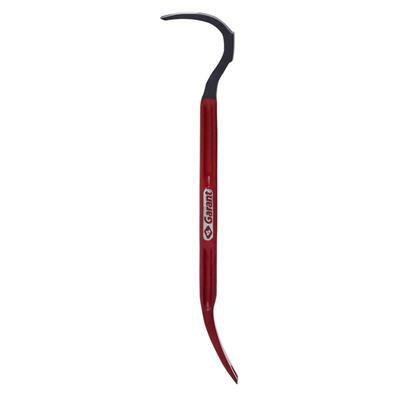 Demolition Stripping Pry Bar is use to rip out nails and demolish different structures quickly and efficiently with the help of the Garant Pro Series professional demolition bar. This 24 inch (61 cm) tool is made of ultra-robust forged and tempered steel. Its oversized striking surface is properly placed to facilitate the insertion of the tool with precision and safety and increases the durability. Its large curved extremity offers a constant pivoting point for optimal leverage during the whole removal. For maximum flexibility this bar is equipped with 2 slots which allows the removal of nails from different positions. Its H shaped handle offers better control and an optimal resistance. This superior quality demolition bar is especially designed for professionals looking for a robust, efficient and safe tool for intense demolition projects needing maximum power. 24 in. Perfect for heavy-duty work requiring maximum power. Oversized and well-oriented striking surface for easy penetration with precision and safety. Its wide curved end gives a continuous pivot point for maximum leverage while pulling. 2 nail slots for removing nails in different working positions. H-Shaped handle allows for better control and maximum sturdiness.